In case you want to hire your own researcher to solve for this problem, because your children and grandchildren won't have a solution to this under current stroke leadership. Figure 1: Caspase-independent cell death cascade. Ischaemia causes calcium influx through multiple channels including, N-methyl-D-aspartate (NMDA) receptor, acid sensing ion channel (ASIC), and TRPM7, which leads to increased neuronal nitric oxide synthase (nNOS), and generation of peroxynitrite (ONOO−) from nitric oxide (NO) and superoxide (O2−), damaging DNA. O2− is generated from NMDA receptor activation of nicotinamide adenine dinucleotide phosphate oxidase. 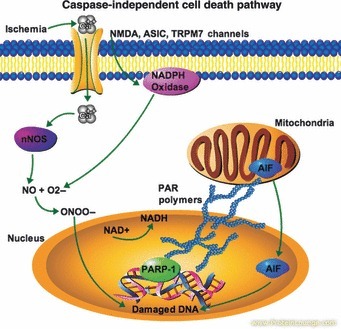 The DNA repair enzyme poly-ADP-ribose polymerase-1 (PARP-1) is activated utilizing cellular nicotinamide adenine dinucleotide (NAD+) forming poly-ADP-ribose (PAR) polymers, which cause nuclear translocation of apoptosis inducing factor (AIF) further damaging DNA. Cell death occurs from AIF-mediated DNA degradation and NAD+ depletion causing energy failure. 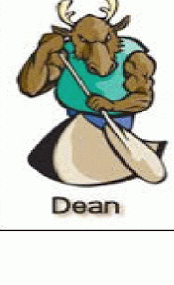 What plays the role of executioner?